When you are searching the internet, you may meet nice Web page. You want to save the link of the Web page if you just save in the short term. But if you want to save page permanently, you need to save for offline use. 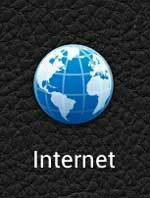 The Default Android browser, it is the application that is displayed as image of following. How to save offline Web page is as follows. 1.Display the web page you want to save the Android default browser. Thus, Web pages saved in android default browser.